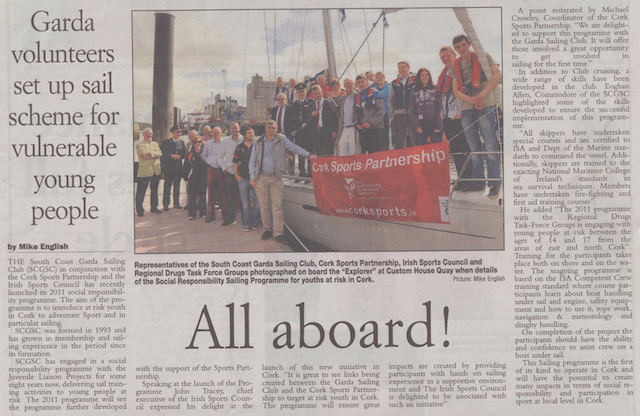 The South Coast Garda Sailing Club (SCGSC) in conjunction with the Cork Sports Partnership and the Irish Sports Council has recently launched its 2011 social responsibility programme. The aim of the programme is to introduce at risk youth in Cork to adventure Sport and in particular sailing. The SCGSC was formed in 1993 and has grown in membership and sailing experience in the period since its formation. The SCGSC has engaged in a social responsibility programme with the Juvenile Liaison Projects for some eight years now, delivering sail training activities to young people at risk. The 2011 programme will see the programme further developed with the support of the Sports Partnership. Speaking at the launch of the Programme John Tracey, CEO of the Irish Sports Council expressed his delight at the launch of this new initiative in Cork. “It is great to see links being created between the Garda Sailing Club and the Cork Sports Partnership to target at risk youth in Cork. The programme will ensure great impacts are created by providing participants with hands on sailing experience in a supportive environment and The Irish Sports Council is delighted to be associated with such an initiative”. In addition to Club cruising, a wide range of skills have been developed in the club. Eoghan Allen, Commodore of the SCGSC highlighted some of the skills developed to ensure the successful implementation of this programme. “All skippers have undertaken special courses and are certified to ISA and Dept of the Marine standards to command the vessel. Additionally skippers are trained to the exacting National Maritime College of Ireland's standards in sea survival techniques. Members have undertaken fire-fighting and first aid training courses”. He added “The 2011 programme with the Regional Drugs Task-Force Groups is engaging with young people at risk between the ages of 14 and 17 from the areas of East and North Cork”. Training for the participants takes place both on shore and on the water. Initial safety and introductory training takes place ashore. The seagoing programme is based on the ISA Competent Crew training standard where course participants learn about boat handling under sail and engine, safety equipment and how to use it, rope work, navigation & meteorology and dinghy handling. On completion of the project the participants should have the ability and confidence to assist crew on a boat under sail. As a result of the programme, the communication skills of all involved will be improved and the understanding of the importance of discipline as an element of safe behaviour will be enhanced. This Sailing programme is the first of its kind to operate in Cork and will have the potential to create many impacts in terms of social responsibility and participation in sport at local level in Cork.